Today, people have found various usages for digital signage, from digital menus to providing on-premise wayfinding, to retail, schools and even governments. It can also be used with Raspberry Pi, and this combination has various applications of its own. However, modern digital signage is still maturing, and there is so much more to learn and so much space to grow and evolve. Fun fact: by 2025, the digital signage market is expected to grow to $31.71 billion. So, what else can we expect? Where else can this great technology be implemented, and what does the future hold? You may have witnessed some of its uses without realizing it, or you may have heard about some awesome features that are getting popular today – or it may be a completely new term for you. One thing is for sure: great things are ahead. 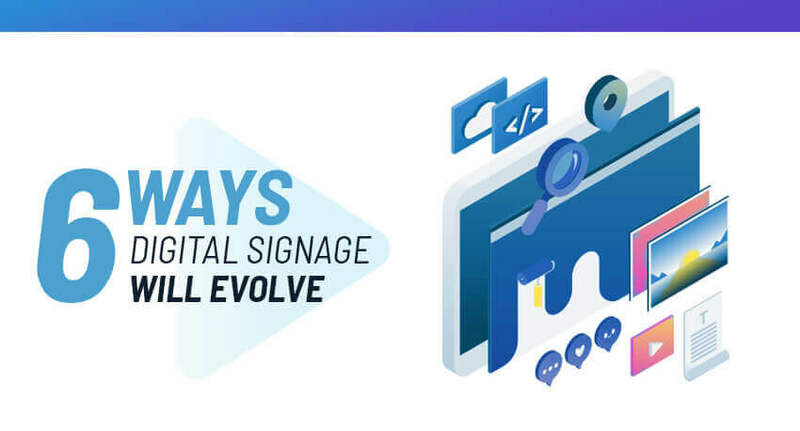 Today, we’ll tell you all about how digital signage will evolve in the future to facilitate better customer engagement in various fields and industries. Imagine digital signage capable of personalizing your messages, or real-time responses to different situations. Well, that’s not as crazy as you may think at first. With the help of artificial intelligence and deep learning, this is one of the next steps in the evolution of digital signage. Basically, the implementation of AI in digital signage platforms will result in a more personalized experience for every customer. Thanks to its deep learning ability, AI would actually be able to recognize customers and adapt to the needs and wants of each one. It could go as far as using their previous buyer history to recommend next purchases and items on sale, providing real-time value to each visitor of a store. With the appearance of online shopping, brick-and-mortar facilities are pushed into trying new marketing strategies and special experiences for their customers, trying to make them come back. AI with digital signage could be just the thing to turn the tables again, providing personalized ads for each customer, using deep learning to appeal to every individual and making every purchase a delight and a great story for family dinner. It seems like the future is right around the corner – and who knows what other innovations we’ll see in this field. Augmented reality is getting more and more popular in marketing, and for a good reason. By putting it to use, various companies have had very successful campaigns. Now, when you combine augmented reality with digital signage, you have a winner! You’re probably used to seeing it AR in apps, or hearing them through headsets, but what happens when it shows up on a big screen? 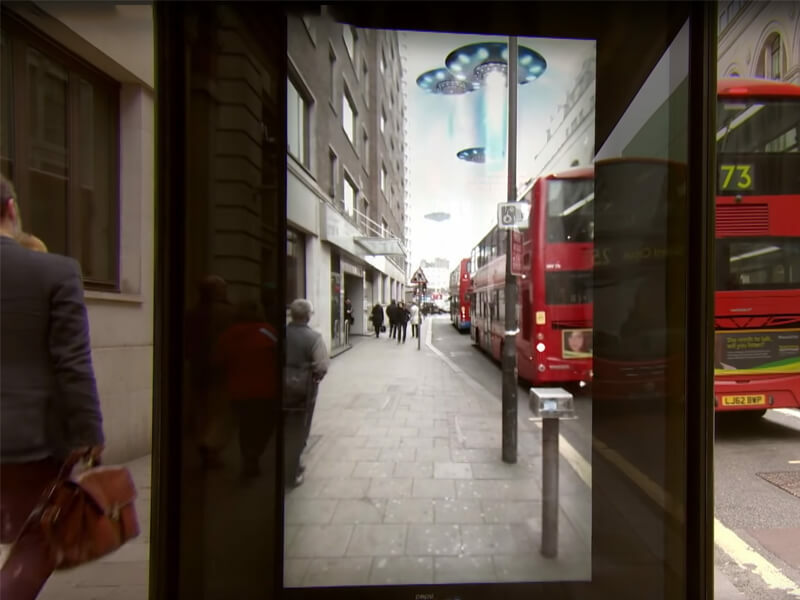 Well, people have been extremely creative when it comes to using this new technology combination for advertising, so you can see a virtual shopping assistant, try out a new outfit without actually putting it on, or even experience an alien attack on a bus stop. Seriously… it’s been done, and people have loved it. 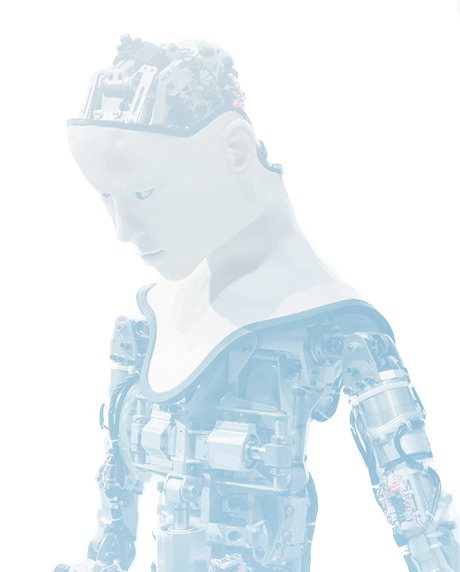 The smart technology is capable of detecting various features of people in front of the screen, including clothes, height, and even facial expressions – and it responds to them personally. Amazing, huh? The use of digital signage in retail is more important than ever, as we know that many people nowadays choose to buy clothes online instead of going to a store. However, it is also interesting to note that research has shown that customers still prefer to shop in a store when buying clothes. It is just the matter of bringing the best of the online world into the brick-and-mortar stores – and that’s where digital signage comes in. The use of fitting rooms equipped with smart shopping mirrors is just what clothing stores need to bring their customers back. It is imagined as a way to make the fitting room experience less awkward and more convenient for each customer. By communicating with the touch screen mirror, which scans everything they brought into the fitting room, each person can browse through other colors, sizes, and even similar items, to choose another one that they want to try. Without having to leave the room, the clothes are then delivered to them by a shopping assistant. Of course, each person can choose to just use the mirror to see themselves – nothing is pushed on them – which makes it even more interesting. By enhancing the experience of each shopper, making it all about them, and providing the best possible service, clothes stores now can give their customers the perfect combination of online and offline world. If you haven’t heard of this term before, let us first break it down to you – it’s a great combination of technology and decorating. In other words, tech can be used as an element of interior design. Makes sense, right? When techorating is implemented with digital signage, miraculous things can happen. Using a large display, several of them, or even a collage, that is not only decorative but also responsive, is where the technology is headed at the moment. The goal remains the same – engage the visitor, entertain them, provide value and beauty, and of course, stand out from the crowd. This will allow the hotels, hospitals, or corporate lobbies to change their interior on a daily basis, staying fresh and always interesting. 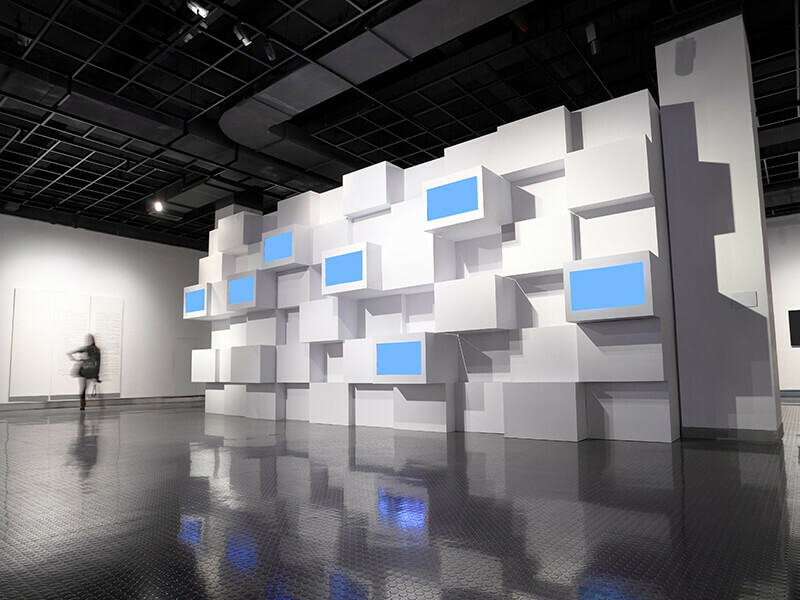 The future awaits, and it will hold digital signage, decoration, and technology, all in one place – and we’re sure it will be an outstanding experience! Whether it is for improving customer experience, making your brand stand out, putting together an outfit or pushing a notification on someone’s phone, it is obvious that digital signage is a very useful tool for businesses in today’s world. And, since this is all still new technology, it has yet to grow, evolve and become better and smarter. We are literally witnessing the growth of something that could change all of our lives in so many different aspects – make them easier, more fun, more exciting and more enjoyable. As you can see, the future of digital signage is bright, and it is bringing a lot with it. We, for sure, can’t wait to see what else will come up. Don’t you agree? A Bluetooth beacon is basically a small Bluetooth radio transmitter that works on batteries. To avoid getting all technical, we’ll just tell you that it will trigger a notification on your phone if you enter a place where it is installed. If you are interested in how it actually works – check out this link. What’s amazing about beacons is that they have shown to develop the highest click-through rates of all the popular advertising techniques. It is better than Facebook, Twitter and display ads. And, we know that clicks often result in sales, which is why they are super interesting to marketers. They can be used in various ways, such as in-store navigation, personalized advertisements based on location, pushing service information, or receiving insight from the customers. The options are limitless, really, and it is only a matter of the creativity before we see the next big campaign in this field. The Samsung Smart Signage Platform (SSSP) is an open-source all-in-one solution embedded in Samsung smart signage. What’s great about it is that it doesn’t require any additional devices in order to play digital media, or communicate with the server. Equipped with a quad-core processor, 1.5GB Dual 48Bit DDR3 DRAM, 8GB of storage, wireless and LAN connection, and a video processor that can play WMV, MP4, and H.264, it is a new tech that brings on so many options literally at the tip of the user’s fingers. In other words, no PC is required to use digital signage with this platform. This is basically an external media player that features a SoC-based app launcher, allowing you to manage digital signage with extreme ease, as never before. Introduced back in 2013, SSSP allows its users to create apps and software on their Samsung displays, download them from a custom URL, and play content directly from the server using a wired or wireless connection. This amazing technology is literally something that was once only a part of science fiction movies – and today, you can use it in real life. It is amazing how fast it all happened, right? It is now only a matter of time before it brings on something new and never before seen. Digital signage is on its way to becoming one of the technologies with most various usages in our society. From artificial intelligence providing a more personalized experience for each and every customer in a shop and augmented reality in advertisement, to shopping mirrors that show you what an outfit will look like and give advice, to techorating. And that’s not all, other things await, such as Bluetooth beacons, SSSP and many more that are yet to be published. Possibilities really seem endless at this point. As you can see, the future of digital signage is bright, and it is bringing a lot with it. We, for sure, can’t wait to see what else will come up. If you have a unique idea of your own cooking we can help you realize your own digital signage goals. Schedule a consultation with one of our experts today.